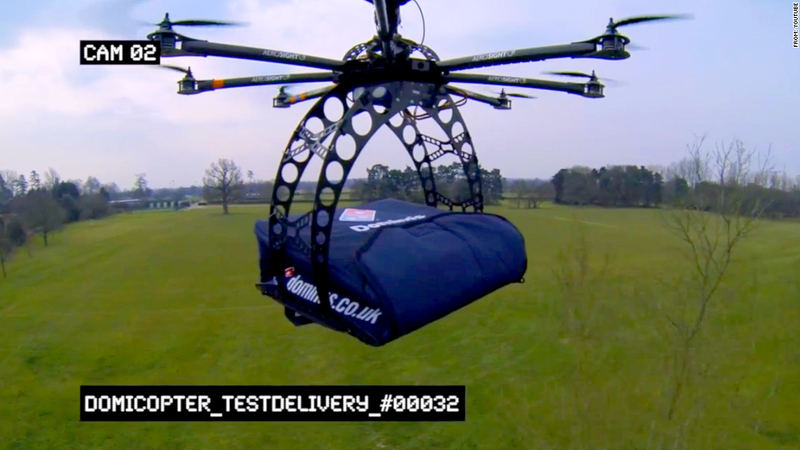 Domino's U.K. released a concept video of the "DomiCopter" delivering two pizzas. In perhaps the first bit of "technological research" to involve flying pepperoni, Domino's has developed a drone capable of delivering pizzas. While the idea is likely just a PR stunt, a Domino's (DPZ) franchise in the United Kingdom posted a video on Monday of the unmanned "DomiCopter" actually delivering two pizzas in the company's signature Heatwave bags. A spokesman for the Michigan-based pizza company confirmed that the concept is "the brainchild of our independent master franchise company in the U.K." The digital media company T and Biscuits partnered with drone firm AeroSight to bring the idea to life. But don't expect two piping hot pizzas to be delivered to your door via drone anytime soon. A similar idea called the TacoCopter -- an app that would dispatch a drone to deliver a taco to your door -- went viral last year, but the service is illegal under U.S. law. Federal Aviation Administration rules ban unmanned aircraft like drones from being used for commercial purposes. A DomiCopter in the United Kingdom seems just as unlikely. "Our emails have been going mad with inquiries as to when people may be getting their food delivered by the DomiCopter. You will have to just wait and see ... and then wait," T and Biscuits wrote on its own page unveiling the video. Domino's U.S. spokesman Tim McIntyre made clear "this has nothing to do with us in the U.S. and we have no plans to pursue this idea." Nevertheless, Domino's U.K.'s press release talked about how the DomiCopter "could fit the bill" for innovative ways to deliver pizza, and said a "Domino's Flight Academy is also rumored to be in the pipeline should the DomiCopter delivery service take off." While the DomiCopter is perhaps the silliest example of possible drone use, it's a burgeoning field full of legal and ethical questions.